Based on its ballistic missile tests so far, including its most recent ones last month, Russia believes the DPRK hasn’t yet achieved ICBM capability. Noted ballistic missile/rocket expert Theodore Postol partly agrees, along with German rocket experts Markus Schiller and Robert Schmucker. While it’s unable to manufacture sophisticated rocket components so far, the skill and ingenuity of its scientists in using Soviet Russia-era rocket motor components “has grown very substantially,” they said. The July tests carried reduced payloads – able to reach a much higher altitude than possible if carrying a nuclear warhead and protective heat shield. Pyongyang achieved its objective, creating the false impression of being able to strike US territory – what it’s unable to do based on the authors’ analysis. Yet technological progress it’s made indicates it’s heading toward eventually achieving what it can’t now accomplish. The authors cautioned that no one outside North Korea has reliable information on the characteristics of its nuclear weapons designs – including whether miniaturization was achieved to permit their mounting on a ballistic missile, despite suggestions otherwise. Based on available information, they estimate Pyongyang could only deliver a nuclear warhead as far as Anchorage, Alaska weighing 500 – 550 kg. “So it is entirely possible that this variant of the Hwasong-14 (tested in July) will not be able to deliver an atomic bomb to Anchorage, Alaska,” they said. If the Hwasong-14 upper stage was “fitted with the more capable vernier motors from the SS-N-6 submarine launched ballistic missile (known in Russia as the R-27), it could potentially deliver an atomic bomb to Anchorage, if the bomb weighed less than between 650 and 750 kg,” according to the authors. 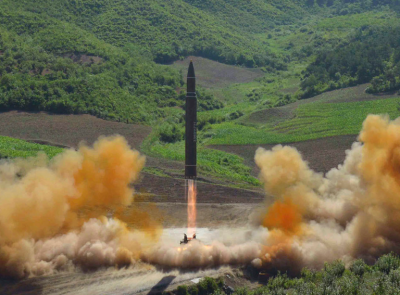 “The same upgraded variant of the Hwasong-14 could only deliver an atomic bomb to Seattle if the bomb weighed less than between 400 and 450 kg,” they added. Regardless of current or likely more advanced DPRK capability later on, the nation’s history shows it threatens no other nations. Its nuclear and ballistic missile weapons are solely for defense – deterrents against feared US aggression. The real menace lies in Washington, not Pyongyang.